Today brings us the much awaited first couple of Quarter Final games in the FIFA World Cup between Uruguay and France, followed by Brazil versus Belgium. The winner of these matches will face-off in the coveted Semi-Finals matches against each other, and in the final, they could either meet Sweden, England, Russia or Croatia, which most people wouldn’t have thought plausible, with important teams such Spain, Argentina, Portugal and Germany already eliminated. Uruguay v France is the first of the day’s Quarter Final matches kicking off at 15:00pm (GMT) or 16:00 (CEST), and both sides have to make some changes after progressing through the second phase and first knock out round. Uruguay are the most hardly hit in terms of team selection, with star striker Edinson Cavani picking up an injury at the end of their 2-1 victory over Portugal, which means that he is not fit enough to feature in this crucial match. This means that more scoring responsibility is put on Luis Suarez, which isn’t a problem, however, Suarez is also suffering from a knock in training, but will likely play through any pain barrier for La Celeste. Not ideal preparation for Uruguay and it’s now a question as to who will partner Suarez, or whether they will add an extra man in midfield. Cristhian Stuani or young Maximilliano Gomez would be the replacements for Cavani, but we suspect they will opt for an extra man in midfield against the French. 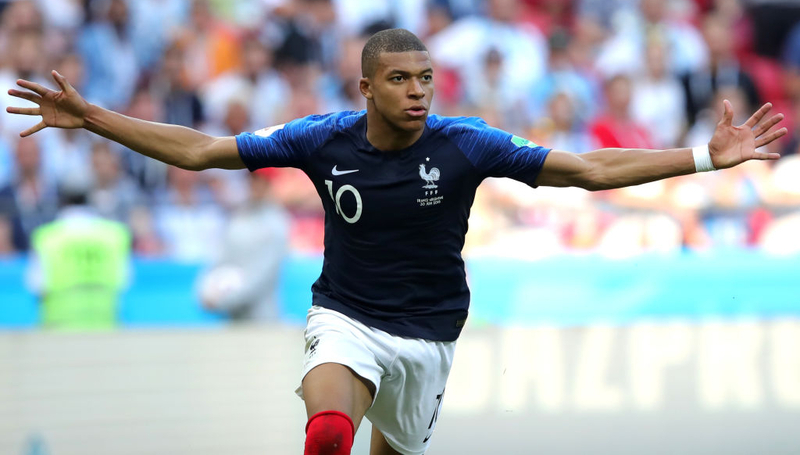 France are coming off the back of a very impressive and surprisingly comfortable 4-3 victory against Argentina in the last round, with Kylian Mbappe, 19, steam rolling through with the ball against team Messi to notch a penalty and then later scoring two goals. If Uruguay’s midfield don’t track back and if the defence play too high up on the pitch, this will leave too much pace in-behind, which Mbappe would surely exploit and if any hard tackles come flying in, Mbappe will surely go down, perhaps even in the penalty area. Blaise Matuidi is suspended for this match, with Correntin Tolisso likely to deputize in midfield, and Djibril Sidibe is once again a doubt at full back, with Benjamin Pavard looking to keep his place in the team, after scoring against Argentina. Apart from these minor tweaks, France are expected to field a similar side as in their victory in the last round. Most would predict a France win, plus given the exclusion of Edinson Cavani, Uruguay will have less firepower. However, Uruguay are strong defensively and physically, as we have already seen, and they may wait for their chance to score, playing deep in order to frustrate the French. It remains to be seen whether Griezmann or Mbappe will be able to handle the physical aspect of the Uruguayan defence, since there surely won’t be a lot of space, but their pace may prove too much for La Celeste. IN saying that, Olivier Giroud could become vital in aerial battles today. In the evening Quarter Final match, it’s Brazil v Belgium, and it’s surely the tie of the round, with probably two of the best teams in the tournament, kicking off at 19:00pm (GMT) and or 20:00pm (CEST). We can expect a very entertaining game with Neymar Junior coming in for a lot of criticism for his diving in the last match. But, Brazil have anchor midfielder Casemiro out through suspension, with Manchester City’s Fernandinho expected to fill his position. Marcelo looks fit to regain his place at left back, whereas Gabriel Jesus’ place is under threat from Liverpool’s Roberto Firmino, who scored in their last match against Mexico. Gabriel Jesus has so far failed to score in this World Cup, but Coutinho and Neymar have supplemented the goals in his place. Chelsea player Willian has been very impressive so far and he will keep his place in a 4-3-3, rounding off a devastating attacking three. Paulinho looks set to continue in midfield, after there were doubts about his fitness. Belgium come into this match, after a narrow late winner against Japan, with a 3-2 scoreline as Nacer Chadli slid-in to slot home, sending Japan packing. But, in leaking two goals against Japan, suggests that the Belgium defence isn’t suitably prepared for Brazil, but this World Cup has been very unpredictable, so it’s not a given that they will lose this match. Belgium have no missing players, and will be high on confidence, with both Fellaini and Chadli hoping to start this match. Vincent Kompany will likely keep his place in central defence, with Yannick Carrasco likely making way for Chadli, as he already made his mark against Japan. Axel Witsel and Kevin De Bruyne will keep their places in central midfield, and Eden Hazard and Dries Mertens will play in behind Romelu Lukaku. But Mertens could be sacrificed for Fellaini, seeing Kevin De Bruyne play in a more of an attacking position. Brazil are yet to fully hit the ground running in this World Cup, after stuttering against very defensive sides, but against Belgium we can expect more attacking free flowing football, but just as to how the game will go, is anyone’s guess. Since both teams have flair and skill, but historically, the outcome favours the Brazilians, but Belgium will look to change the course of history tonight.